I hear legends of companies who hire nothing but programmers in their test departments, and rely almost entirely on code-based tests in their software development methodologies. I’ve never seen such a shop in person. Out here in the Midwest, most testing involves humans directly exercising user interfaces. Eric Jacobson recently wondered aloud on his blog whether testers are simply too busy finding bugs through the UI to move into more technical or programmatic testing. My typical experience has been that Development doesn’t deliver software to QA that is solid enough that testers didn’t have to spend the bulk of their time making sure the UI and the immediate interface with the database are working. For years my schtick was to join a company when it is transitioning from small to mid-sized, when it was feeling crushed by quality problems caused by mounting technical and defect debt. They had focused on getting to market fast but had grown a tangled mess of code. My response was always to grow the QA team, primarily by hiring automation engineers to build out large automated regression suites. After doing that at a couple companies, I lost interest in the strategy. It was expensive, it took too much time, and it never moved the quality needle enough. It just seems absurd to me now to prop up years of thin development practices with more post-development testing, especially given that automated tests in QA generally work through the UI and are therefore brittle and slow. 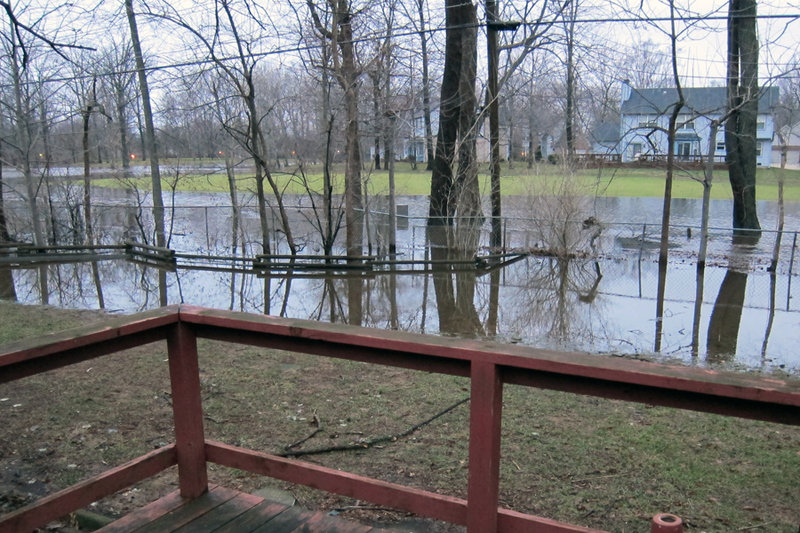 The view from my deck after a particularly heavy rain. You’d better believe the sump pump was running. It’s like when my home’s crawl space used to flood after each heavy rain. A company that specialized in drying out crawl spaces recommended $6,000 in a French drain, multiple sump pumps, and encapsulation to move the water out and keep the moisture from seeping up into the house. But a buddy of mine who builds houses said, “You’ve got a negative grade around your foundation. Buy $300 in topsoil and a couple cases of beer. Invite all your friends over and issue them shovels. Fix the grading and you’ll keep the water from getting in.” I went with the topsoil and the friends. I also put in one sump pump, just in case. It runs pretty much only when the rain is torrential. In case my admittedly imperfect metaphor isn’t obvious, the graded topsoil is the unit testing, and the sump pump is the lightweight QA automation solution. Let’s try preventing the bugs from getting in as much as we can, shall we? But let’s still check for the odd and extreme cases that are bound to get by. This is the hierarchy of testing similar to the one Mike Kelly recommends in this blog post. (He’s building on the work of Brian Marick, by the way, who gives a framework for testing in this blog post.) Mike recommends building on the order of thousands of automated unit and component tests, hundreds of automated business-logic tests, and tens of UI-level automated tests. The unit tests run fast and frequently. The inherently slow UI automated tests run far less often. That’s what I resolved to try after I lost my will to build huge automated regression suites in QA. I deliberately took a QA leadership role with a company transitioning out of its startup phase. The product wasn’t yet too large and too saddled with technical and defect debt; I felt like we could make up the lost ground. After some encouragement from me, the fellow who ran engineering began insisting that developers write automated unit tests for all new code. We started building each release into an environment where developers could perform rudimentary testing on it themselves with realistic data. Their goal was to make sure all the happy paths work, so that when my testers get in there they are not immediately stymied by obvious critical bugs. Before we started to make this transition, I quietly started tracking a simple little metric. I counted the defects QA found, plus the defects created in the release that were found in production, and divided by the number of development hours in the release. The metric was a little mushy because I was working with estimated and not actual hours, and because I was having to make judgment calls about which defects in production were caused by the release and which were latent bugs. But it’s hard to ignore the order-of-magnitude improvement we got on this metric. We were tracking to about .3 defects per development hour in the couple releases before we made these changes, and within two releases we dropped to about .05-.09 defects per development hour and held steady. This had incredible impact. Initial quality went way up in QA, meaning initial quality went way up in production. Just adding these two steps was like flipping a switch not only on many of the quality challenges we faced, but also on the amount of chaos and churn we experienced as an overall engineering team. A side benefit was that developers seemed happier. It wasn’t that writing tests made them happy – it didn’t. They would rather have built more new stuff. But delivering better code into QA meant that they spent less time in the fix-test cycle and were interrupted by way fewer production crises. They told me that finally they could focus. The reason why I titled this post as I did – and it’s meant to be tongue in cheek, by the way – is because my strategy means hiring more developers and fewer testers. But the benefit to testers is that they get to do far more interesting work, going deeper, thinking more creatively, and exploring more technical kinds of testing. I can’t imagine ever moving to an all-code testing strategy. All automated testing can do is repeat series of actions. Skilled human testers can cope with complexity and adapt to change, gain and synthesize knowledge and apply it to their testing, know from experience where the product is likely to be broken, and explore the system creatively. The kinds of products I’ve always delivered and am likely to keep delivering will always need that. Good post. I particularly enjoyed the insight on the Developer benefit (i.e. enjoying the uninterrupted focus on code thanks to fewer bugs returned). I never thought of that, and now I’ll use it as a selling point when talking to engineers about unit testing. Also, while the Marick material you linked is a longtime favorite, I really like the extension of the model that Lisa Crispin and Janet Gregory have been sharing for a few years now. 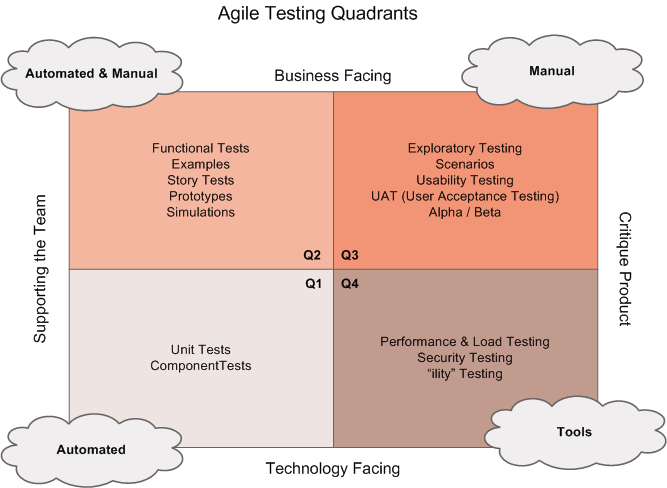 See http://lisacrispin.com/2011/11/08/using-the-agile-testing-quadrants/ for a little discussion, but mostly for the linked http://lisacrispin.com/wp-content/uploads/2011/11/Agile-Testing-Quadrants.png on that page. Thanks for the fresh links from Lisa Crispin’s site, Rick. It’s not clear from context that the story I told was in a mini-waterfall environment and not agile, which is where Marick and Crispin are coming from. And I was just using these ideas as a guide, not as something to doggedly implement. And look at the big benefit I got. Sweet. When an idea applies across dev methodologies, I think it means a universal truth has been discovered. That’s pretty much what we do with semiconductor design and verification, Jim. Rely heavily on unit level testing of the design, then move to multi-unit testing, lastly to full chip testing. And its as automated as is possible, including a heavy reliance on randomly generated test cases. For some reason, Bill, in my application-software world, I meet fierce resistance among developers and dev managers to any sort of rigor around writing unit and component tests. I know one VP of Dev who wanted me to hire people in QA to write the unit tests for them. It boggles my mind.